Within some church settings, the origins of mental illness are believed to be associated with spiritual activity, particularly the influence of demonic forces. Historically, all kinds of health problems were thought to be the result of ‘demonic’ powers. This led to many negative repercussions, especially against disabled people and those with chronic conditions. In physical health, that assumption has been overcome: we now believe that medical science reveals cause and remedy for physical health issues. But the idea has lingered in the area of mental health – some still assume the causes of mental illness are spiritual and treat medical science with scepticism. As a result, there are churches that tend to demonstrate a divided approach to healing: for physical health issues, visit the doctor; for mental health, pray against spiritual oppression. The insistence that mental health problems are spiritual in both cause and treatment can be extremely distressing for Christians. For those suffering illnesses like depression or anxiety, the suggestion that they are under the influence of the demonic only compounds their sense of fear and hopelessness. If they fail to show signs of recovery, often it is suggested that they have weak faith or are even colluding with the demonic power. Suddenly, a problem with their brain chemistry has become a problem with their precious faith. For those suffering with psychotic illness (which can sometimes involve religious themes), such assumptions can exacerbate symptoms and increase paranoia and distress. They can also lead to people not taking the medications that will help them recover. The Bible tells us very little about specific illnesses. We don’t usually read about diagnoses, only symptoms: things like paralysis or blindness. The only accepted medical diagnosis presented by the Bible is leprosy (mentioned 40 times). Whilst people have tended not to suggest medical diagnoses behind the Bible’s negative physical symptoms, they sometimes suggest or assume diagnoses behind emotional symptoms. A key example of this is the Gadarene man who meets with Jesus (see Matthew 8:28-34) and is made well by having a legion of demons cast out of him. His symptoms include nakedness, cutting himself with stones, living in the tombs and violence; he is a dangerous man, strong enough to break chains. This description fits a popular but completely incorrect stereotype of schizophrenic illness. As a result, some people have made the false assumption that negative emotional symptoms are simply the result of demonic activity. Suddenly, every biblical account of healing from the ‘demonic’ is a model for how to heal mental illness. If we were being consistent, we would rub mud into the eyes of everyone with sight problems! Have you noticed how similar the symptoms are between some serious and harmless diseases? If you have ever made the mistake of asking the internet for a diagnosis, you will have discovered that you could have either the plague or just a common cold. Mental health symptoms can look very spiritual and turn out to be caused by some simple imbalances in brain chemistry. We should never assume that everything is spiritual, but instead take a much more balanced and cautious approach, recognising that giving a person the wrong medicine can cause serious sickness and suffering. The centre of our approach in ministering to those suffering with mental illness must be: ‘First do no harm.’ We must always consider the effect that our assumptions and actions are having on someone, however good our intentions. 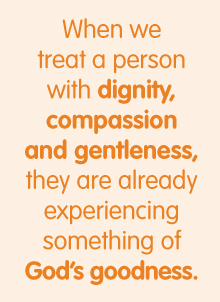 When we treat a person with dignity, compassion and gentleness, they are already experiencing something of God’s goodness. From that place, we can continue to show them that God is with them and loves them. Demonstrating God’s love is not a case of either praying or telling the person to go to the doctor. We can pray for their needs as well as offering practical support, such as cooking or cleaning. We can offer social support – inviting someone for a meal, or out for a walk. And we can also support their medical treatment, by giving lifts or accompanying them to appointments. If people suffering from mental health conditions are going to find safety and love in our churches, it is essential that we explore our assumptions again. Whatever your conviction in terms of the spiritual origins of ill health, Jesus afforded dignity and humanity to every person he encountered. As we do likewise, we can be sure that the supernatural victory is already his, whilst the temporal ministry of care is ours. When undertaking prayer ministry of any kind, refer to your Child and Vulnerable Adult Protection Policies and work within the parameters of your denominational guidelines.